First, you should know that WordPress 2.8 was released last night. Upgrading has never been easier. I’ll be interested to see what the upgrade rate is with this release. 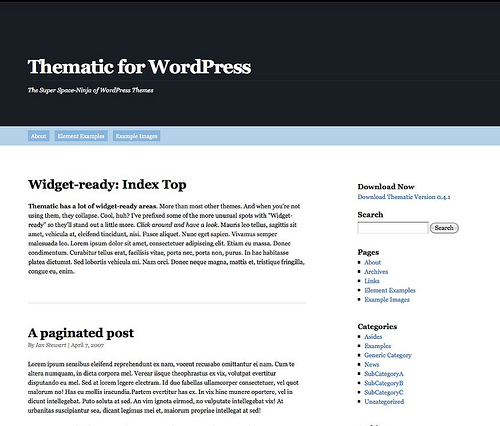 And I just read a great post on 10 Free WordPress themes. There’s some really appealing options in that list. Despite the fact that we’ve been digging into Thesis lately – we’re using it to rebuild this very site and I recently built Ticketfly’s site with Thesis – and we’re liking it, Thesis is a premium theme that will cost you some dollars. Are those dollars worth it? That depends. If there’s one free theme mentioned in that post that I would personally recommend, it would be Thematic. Especially if you are building a WordPress site that will have a more traditional page and subpage information architecture instead of posts.